November 1, 2017 Amy P.
A year or so ago, I saw DaVinci’s quote on my Tumblr feed. It has both inspired and haunted me since. I ask myself: what would a well-spent day mean to me? 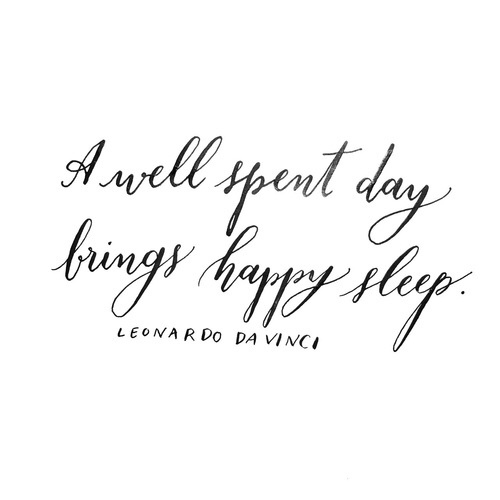 The thing about DaVinci’s quote that makes me pause is the whole bit about happy sleep. I struggle with sleep and always have, finding it difficult to fall asleep and sometimes waking as early as three o’clock, my mind racing with to-do lists, song lyrics or questions related to the past, the present and the future. My mind seems to have infinite capacity for all three. I’ve thought a lot about this quote over the past year, through a cross-country move, saying goodbye to old friends and hello-again to older ones. I thought about it as I packed up our old house and drove through New Mexico, Texas and beyond. I thought about it in hotel rooms, through rainstorms and enduring countless hours of Top 40 countdowns (a twelve-year-old was my wingman). I thought about it standing at the kitchen sink, washing dinner dishes and watching my children doing homework at the table and then my children making ugly remarks to each other at the table and then me walking over to the table and saying, my voice gentle but tight: you must be kind and respectful to each other. I thought about a well-spent day when the kids were off and my husband was gone and the house was quiet, around seven thirty in the morning, and I sat in my bathrobe and thought about what to do that day. I had so many options. Toilets. Dishes. Laundry. Groceries. Baking. Reading. Coffee. Well, after a year of thinking about it, I decided that the answers only come for me when I write about it, so I got out one of my many half-filled journals and began jotting down thoughts, and like it always happens when a creative person (as we all are) gets down to being creative, the ideas and thoughts started coming fast and hard and I couldn’t keep up with it all in my little floral-covered journal with my freshly sharpened pencil. In my journal, and throughout this past year (probably well before, if I’m honest about it), I began to see discrepancies in what I believed would be a well-spent day and how my actual days ended up going. For me, a well-spent day might include fresh, healthy food, gentle exercise, reading, writing, housekeeping and the kind of family togetherness reminiscent of a Normal Rockwell painting. The reality of my day was processed and take-out food, too much coffee, impromptu exercise bursts, Facebook, incessant email checks, dodging housework until the toilets look like truck stops and family togetherness that left me with a tight, hard knot in my chest. Needless to say, happy sleep was elusive. I am settled now in North Carolina, the last (fingers crossed) of many moves as an Army wife. I am sitting in my new bedroom, sans window dressings, boxes still shoved up against the wall, my books stacked on the floor with random items like tiny hand weights, a bathmat and a stack of file folders beside me. With a nascent rooting underway, I feel as if I can begin to address this discrepancy in my days and possibly move (at a turtle’s pace) from harried and haggard to….well-spent. This blog explores what well-spent means and how to shift life so that the days are well spent and sleep is lovely.